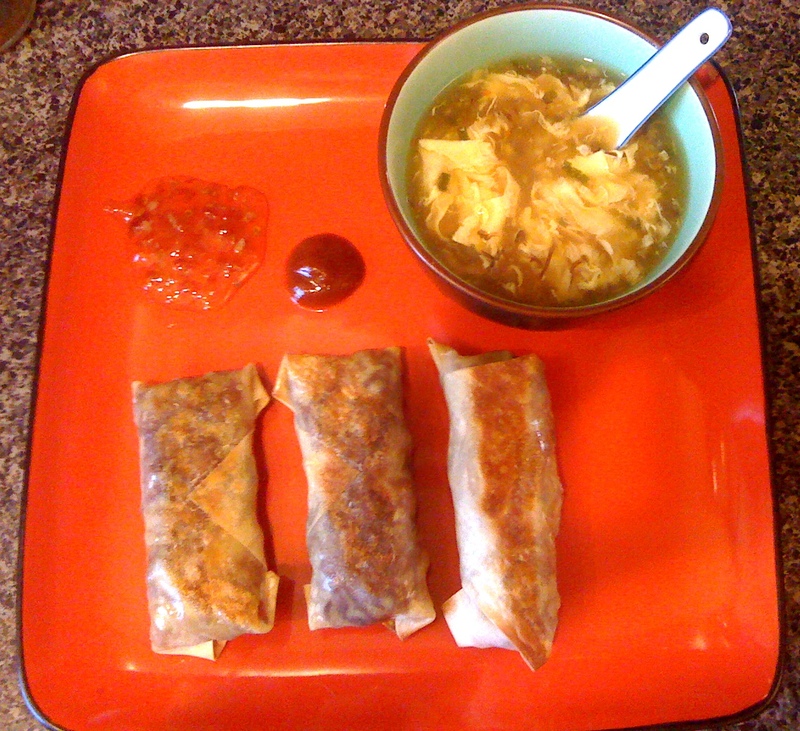 The other day I made some eggrolls and egg drop soup. The eggrolls are filled with an assortment of veggies including cabbage, carrot, and onions. For the soup I cheated a little and used a packet of mix and added the egg in. I saw this recipe on tastespotting and I knew I had to try it! All of the curry in our new wok. 1/4 – 1/2 cup Thai basil leaves, loosely packed. 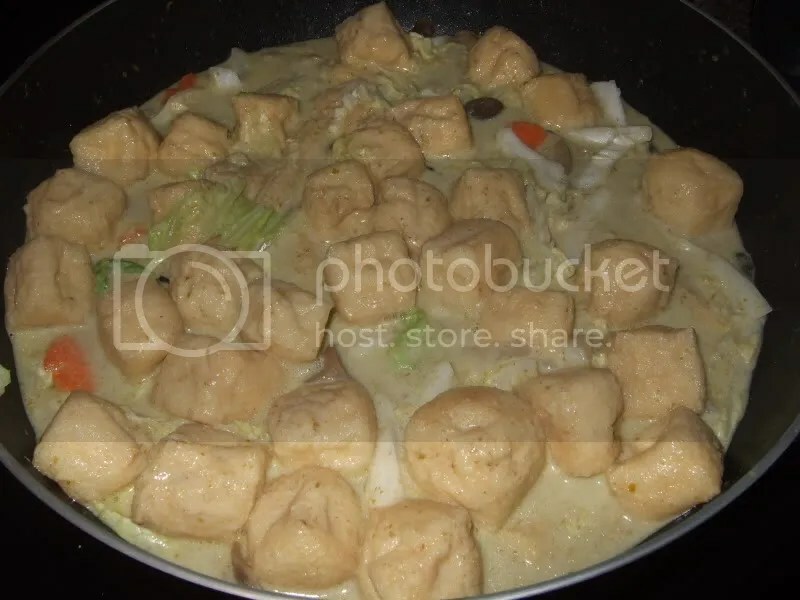 Heat a large wok and place the green curry paste, coconut milk and water in it. Bring to a boil while stirring. Reduce heat and simmer for about 5 minutes. Add all other ingredients, except Thai basil, and boil gently for about 4 minutes or till the cabbage has wilted and the vegetables are cooked but not mushy. Turn off heat. (If the green curry is too spicy for you, add more coconut milk). Sprinkle chopped Thai basil on top. Serve with jasmine rice. I really liked how this recipe turned out. It was spicy, but not too spicy to eat. If you’ve never heard of Banh Mi before, they’re Vietnamese sandwiches that are really good! I first had one only a couple months ago from a Pho restaurant and fell in love. Crusty bread, lightly pickled vegetables, and (for vegetarians) marinated tofu all come together to make something really special. Although they’re usually pretty cheap, I still like to make my own. 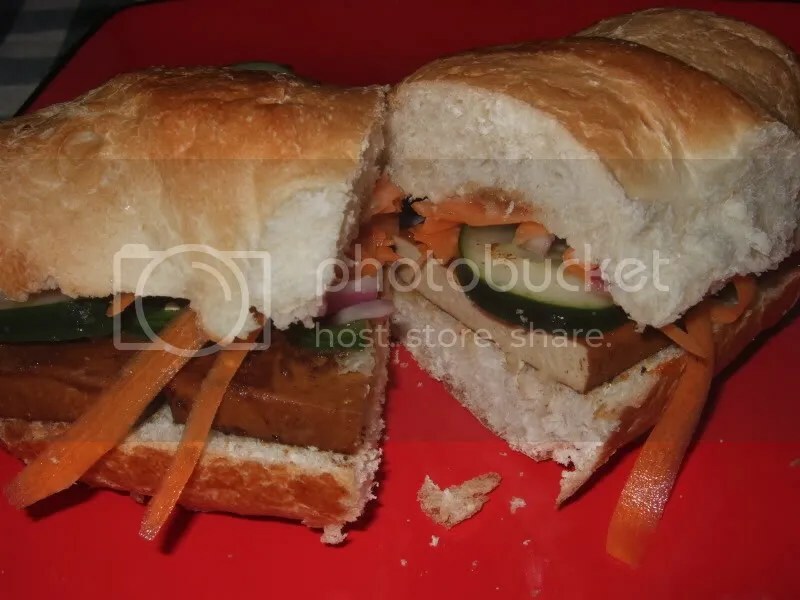 This is my own style of Banh Mi, there are many other ways to make it that can be found online. Add the carrot, cucumber, jalapeno, and red onion to a bowl. Mix together the water, sugar and white vinegar and add to the bowl. Let sit in the refrigerator for at least an hour. Once that’s ready pan fry the tofu with a little sesame oil. Slice the bread in half and lightly toast it. Then it’s time to put everything together. Put the vegenaise on the bread and add a little soy sauce, then add the tofu and put the vegetables and cilantro on the sandwich. Enjoy! I made this the other day and it was great! I found the recipe on Tastespotters.com and changed it up a bit. Heat the oil in a wok over a high heat. 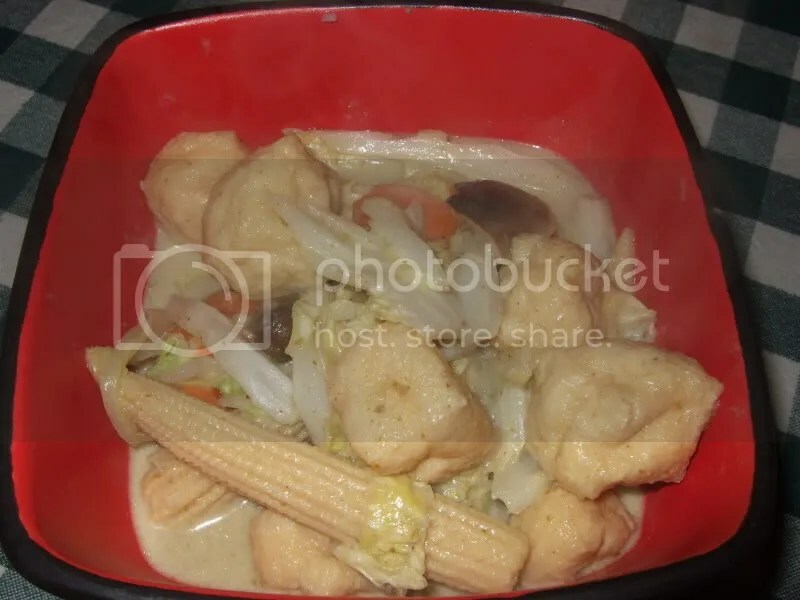 Fry the bean curd in batches until light golden in color. Drain the bean curd on paper towels and set aside. Pour off the oil and reserve 1 Tbsp. Heat the oil on low heat. Cook the garlic until they are fragrant and golden in color. Then turn the heat on high. Toss in the chilies, peppers and onions. 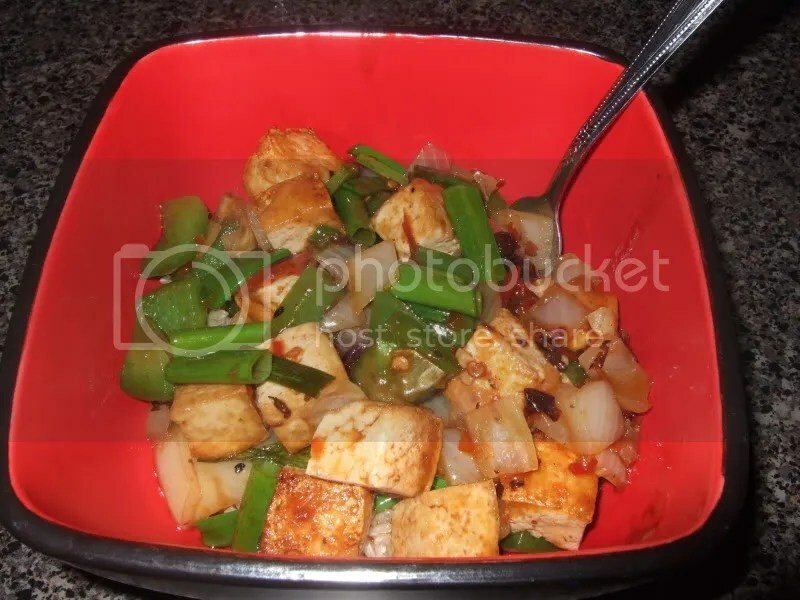 Give it a quick stir, mix in the bean curd and add the sauce and green onion. Bring it to a quick boil and season with sea salt if necessary. Serve immediately with rice or udon noodles. After I opened the can up though I was rather disturbed. The abalone really did look like abalone which kind of worried me. Still I knew they had to be eaten, so I drained the liquid out and threw a few into the stirfry. Once all the vegetables were done I tasted a piece… it was surprisingly good. 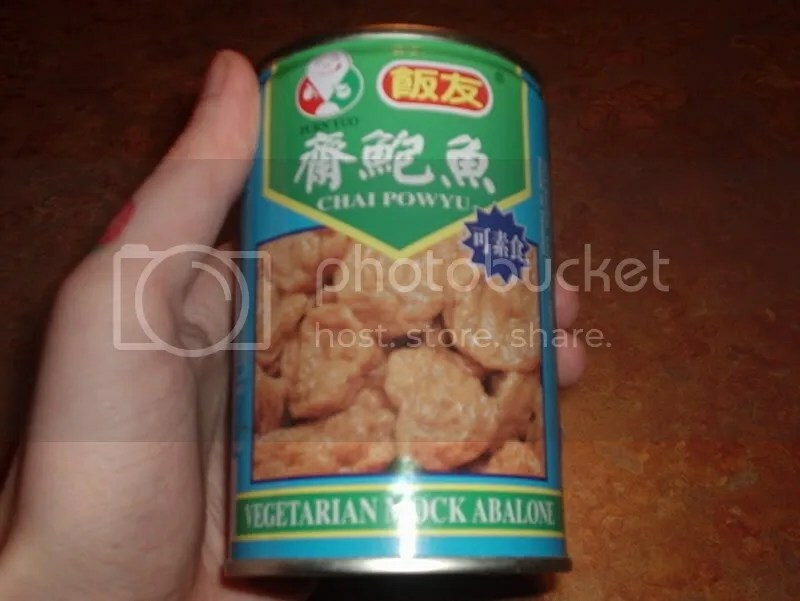 It had a meaty texture and it was lightly soy sauce flavored. Although the texture and appearance was kind of scary for me because it was so realistic, I still enjoyed the stirfry and ate it all. 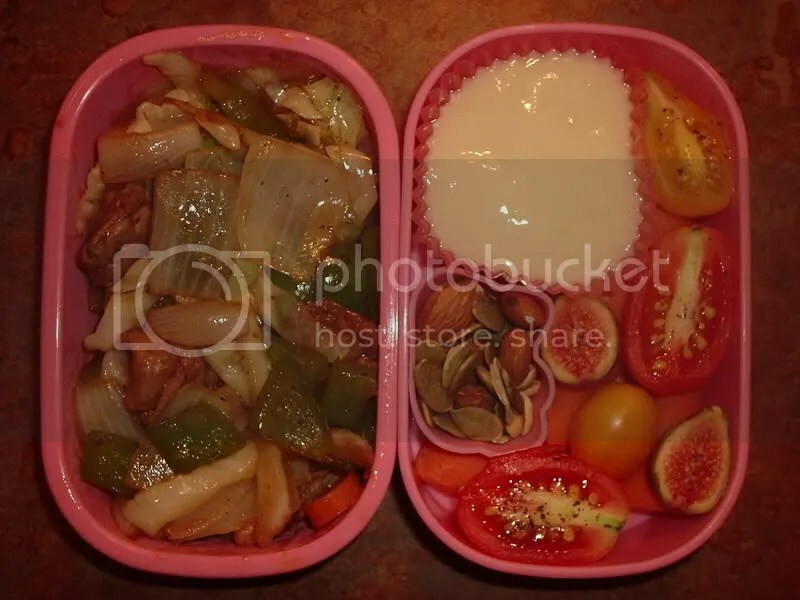 You can see how it turned out on the left side of this bento. I give it a 7 out of 10. It tasted good and I enjoyed it, but it’s not going to be something that I start craving. For dinner tonight, I got a bunch of veggies together to make a nice stirfry with rice for Jason and I. 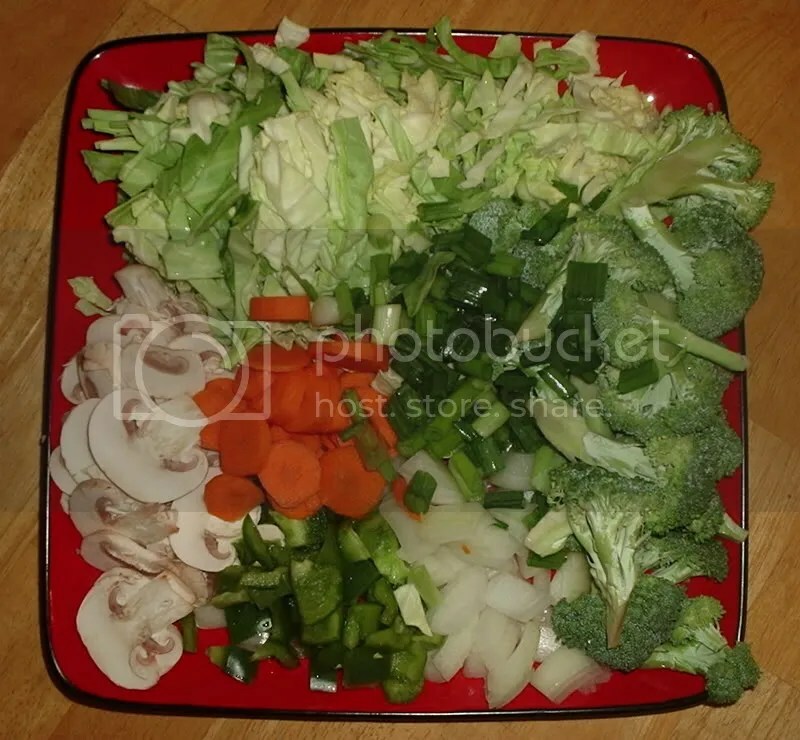 Here you can see the large plate full of veggies I cut up in preparation to cook. Cook rice. Heat olive oil in large saucepan, when hot add onion, garlic and bell pepper. Once they have cooked for 2 minutes, add carrots and broccoli. Cook for another minute, then add sauces. After the broccoli has cooked for a couple more minutes, add the rest of the vegetables, chili paste, sesame oil, and water. 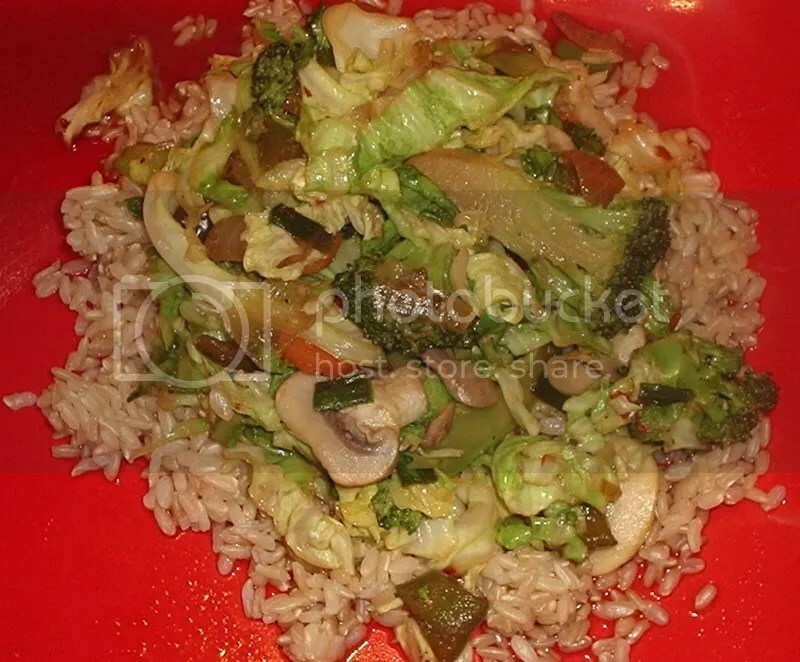 Stir until vegetables get thoroughly mixed with sauce and cook down. When all the vegetables are done turn off heat and serve over rice.